AFTER 24 days, our lambing came to an end at Long Meadow Farm. Final numbers ended at 14 from 11 ewes, with eight males and six females. Our final lamb was born on Sunday morning in the driving rain. I was soaked to the skin, but this was nothing compared to the bedraggled looking urchin that clambered to its feet in front of me. Kehna and her newborn lamb in the pouring rain on the farm. Although we expected the birth to be some weeks away, ‘Kehna’ the mother was showing very few signs of even being pregnant so we presumed therefore that she’d come into season some weeks after all of her mates. But, once again, we were wrong. It’s all good experience though. This week, thankfully, we have averted a number of major calamities, the first being when one of our lambs decided to go through the fence and visit dad. Dad, it appears, wasn’t in a very good mood on the evening in question, and therefore decided to take his mood out on the youngster. It quickly became apparent that I needed to intervene and so leapt over the fence, and intercepted the lamb when Torridon the ram was galloping in to give the little fellow yet another wallop. All ended well, but I was concerned for a moment that I was going to get dad’s curly horns up my rear. Another almost calamitous occurrence happened on Wednesday when I was standing in our kitchen. I noticed our local sparrowhawk fly through the far garden gate, heading down the side of the barn. I immediately thought “Where are the ducklings! ?” But things were happening in just seconds and as I looked to my left I saw the sparrowhawk fly only inches above Alice and her ducklings and take a left turn heading off and through the trees beyond. I was amazed that he had come so close to snatching one of the ducklings for dinner, and for whatever reason we’re just glad that duckling wasn’t on the menu that day. Now, bearing in mind that I had a deaf ear following some over-exuberant hair-washing the night before, I had in fact misheard what she said. 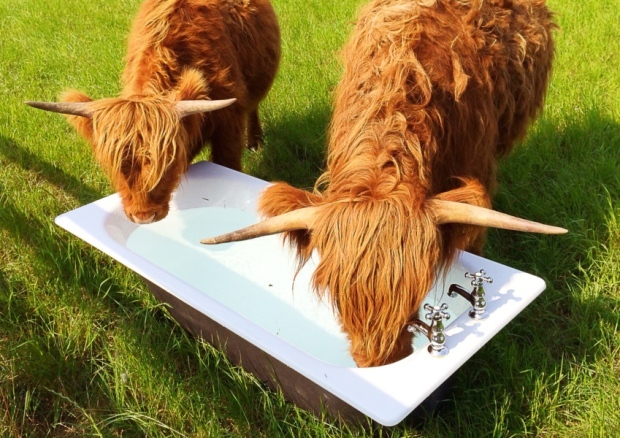 As I ambled closer I soon understood what she was actually saying, when I saw a chicken up to its neck in water in the old bath tub, which the cattle use for water. She had in fact been saying: “Is the chicken alright in the bath!” So, again, we had been able to escape a disastrous end. Once more this week, I was reminded how little real work I have done over the years. In preparation for this week’s photography exhibition I was able to acquire an additional 120 bales of hay from a very kindly farmer. I went to assist the filling of the trailer ahead of delivery and very quickly wished that I had spent more time lifting weights over the years, instead of being the slacker that I so often was. We finished the collection and then promptly had to bring the bales home and then remove them from the trailer by hand and stack them in an orderly fashion in the barn. Very soon the bales were getting heavier and heavier, but the end result was worth all of the hard work, even if it did almost kill me.